Therfield Heath is a special place. It is Common Land and most of it is a Local Nature Reserve and a Site of Special Scientific Interest. One area is also a Coronation Meadow. It is owned by the Therfield Regulation Trust, which is a registered charity. It is managed by the Conservators of Therfield Heath and Greens. People value the Heath for many reasons, to enable everyone to enjoy their visit we have to have Rules or Bye Laws. These are displayed at most of the entrances to the Heath. There are as few as possible to try to make everyone’s visit safe and enjoyable. 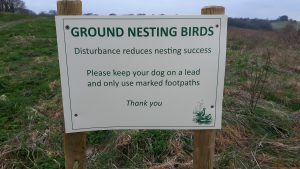 Please be considerate to the ground nesting birds on site by keeping yourselves and your dogs on pathways at all times between 1st March and 31stJuly. It is really important you don’t allow your dogs to run through the long grass disturbing the birds while they attempt to nest because it reduces their chances of successfully breeding. It is common practice to request that dogs be on leads on land where birds nest on the ground during their breeding season. Many National Trust, RSPB and Wildlife Trust sites as well as areas such as the Peak District and Malvern Hills put signs up during these times. On Therfield Heath, the species of concern are Skylarks, Meadow Pipits and Grey Partridges. All three species are Birds of Conservation Concern in the UK. Skylarks and Grey Partridges are on the ‘red-list’ (most threatened) and Meadow Pipits on the ‘amber-list’. Please do your bit to help protect these vulnerable species and allow them to flourish in our community. They can only do so if we all take some responsibility for them.